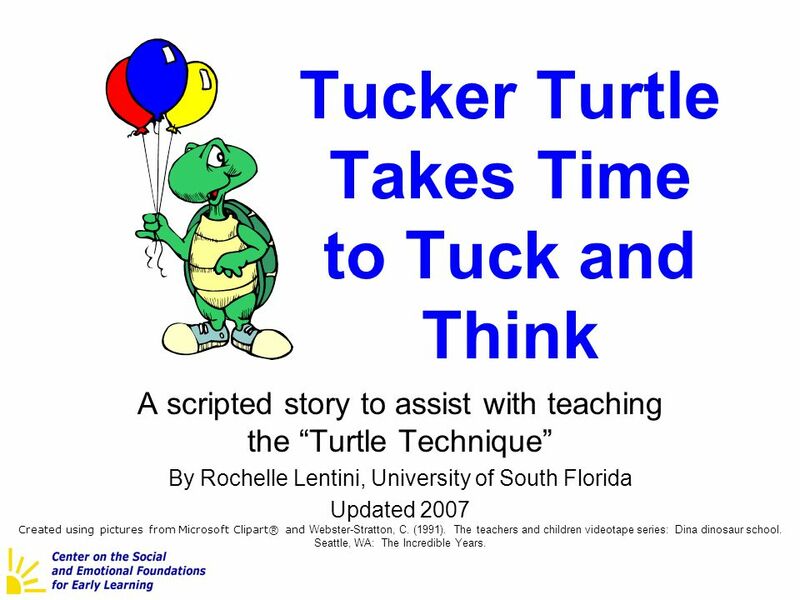 A scripted story to assist with teaching the “Turtle Technique” By Rochelle Lentini, University of South Florida Updated 2007 Created using pictures from Microsoft Clipart® and Webster-Stratton, C. (1991). The teachers and children videotape series: Dina dinosaur school. Seattle, WA: The Incredible Years. 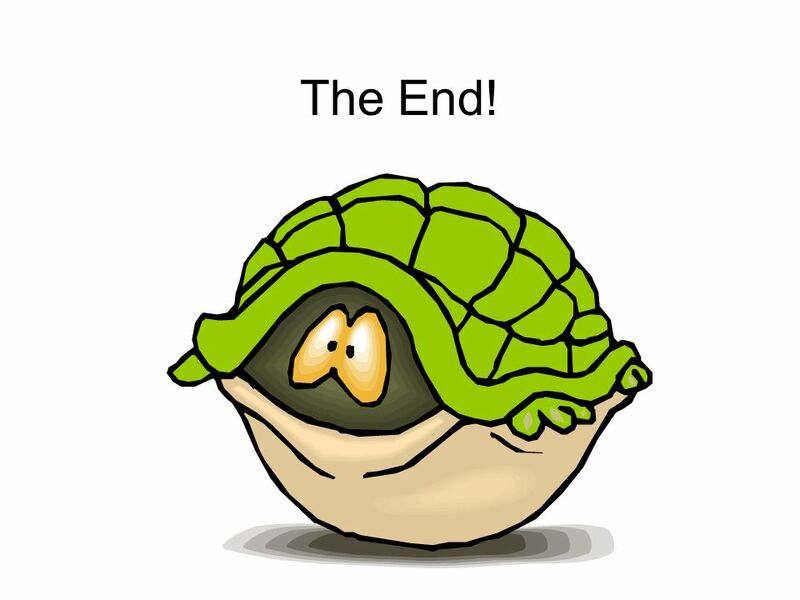 Tucker Turtle is a terrific turtle. He likes to play with his friends at Wet Lake School. 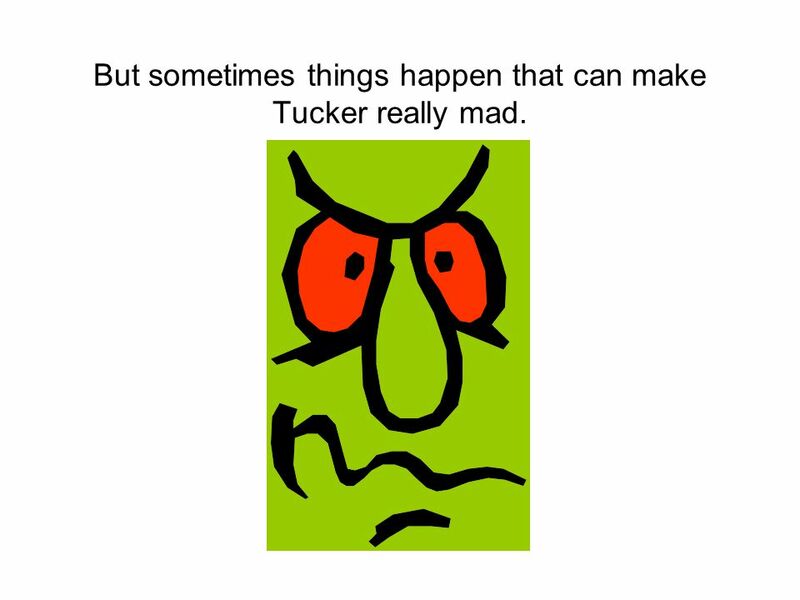 3 But sometimes things happen that can make Tucker really mad. 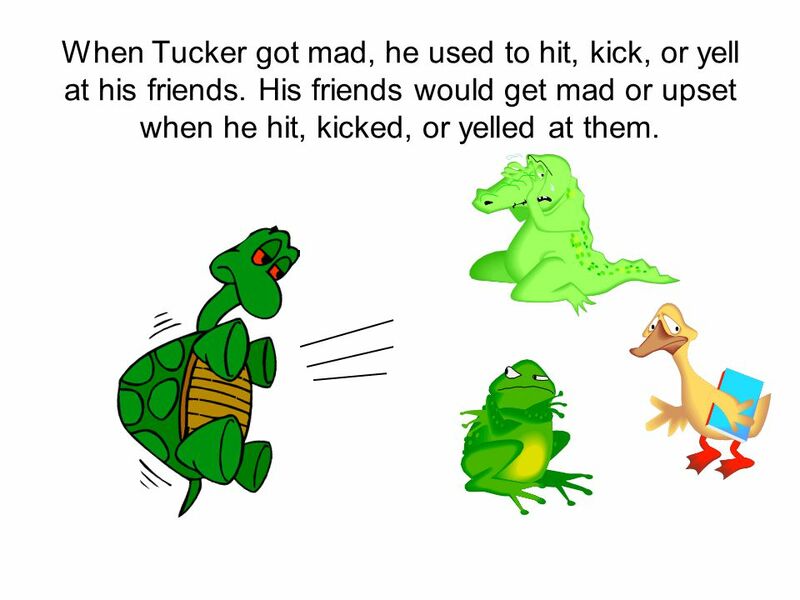 When Tucker got mad, he used to hit, kick, or yell at his friends. His friends would get mad or upset when he hit, kicked, or yelled at them. 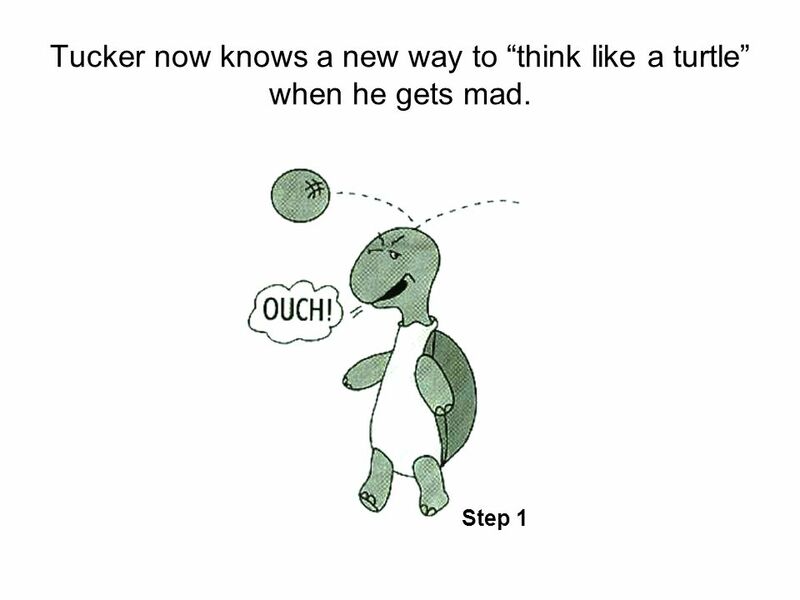 5 Tucker now knows a new way to “think like a turtle” when he gets mad. 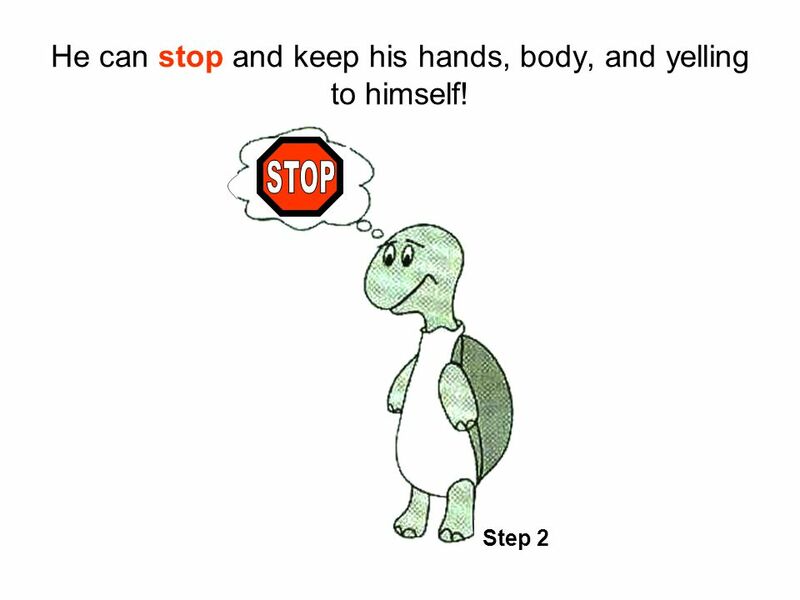 6 He can stop and keep his hands, body, and yelling to himself! 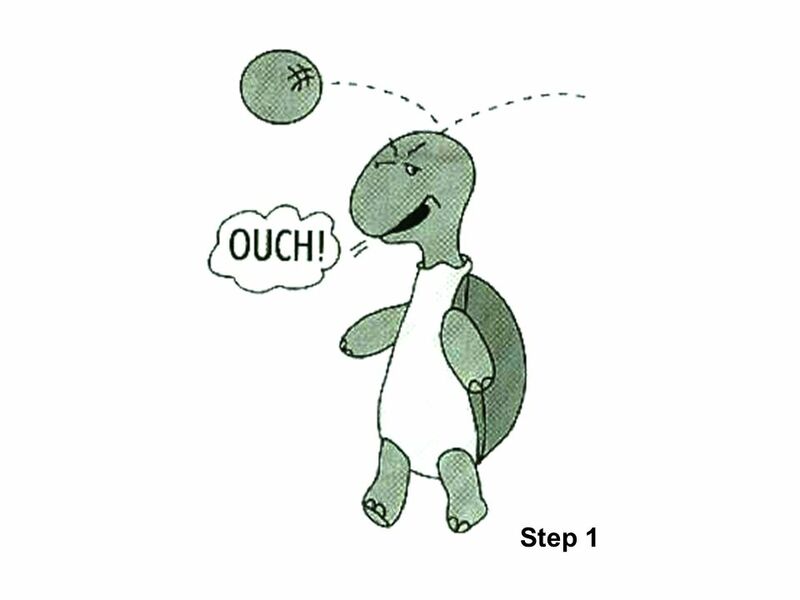 7 He can tuck inside his shell and take 3 deep breaths to calm down. 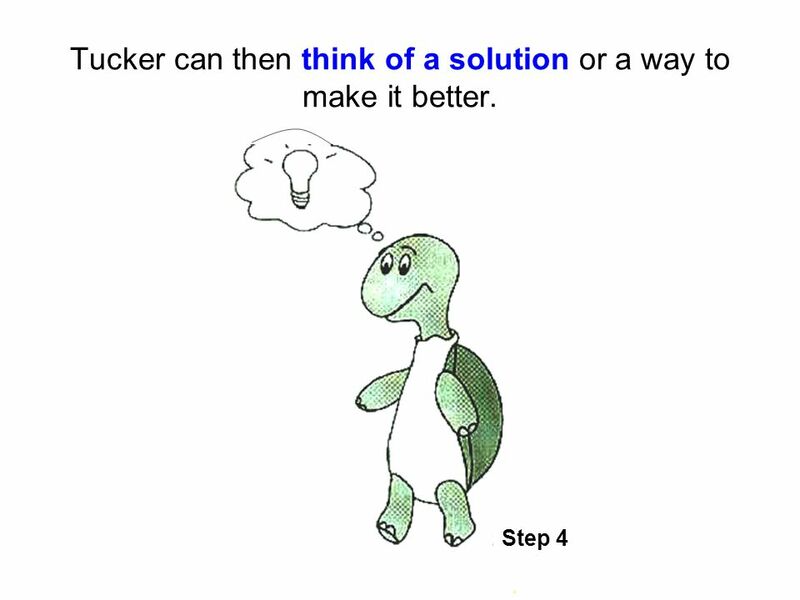 8 Tucker can then think of a solution or a way to make it better. 9 Tucker’s friends are happy when he plays nicely and keeps his body to himself. 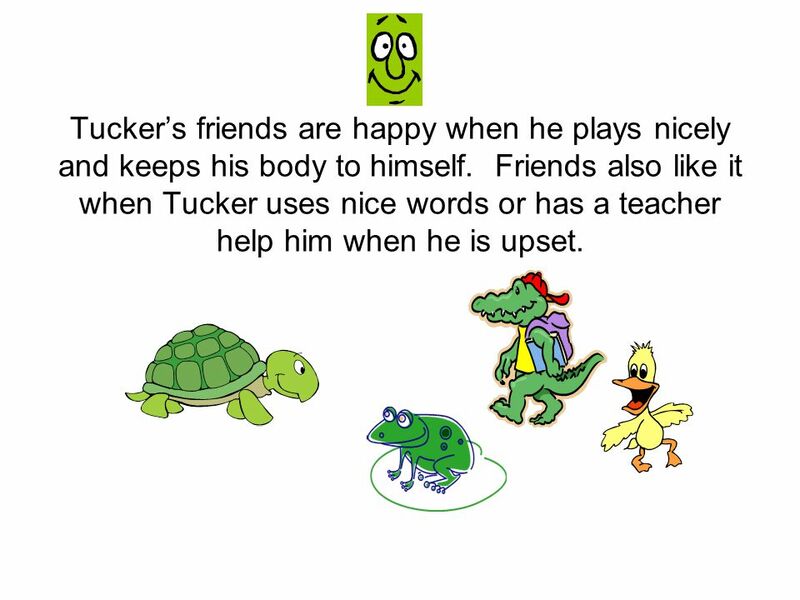 Friends also like it when Tucker uses nice words or has a teacher help him when he is upset. 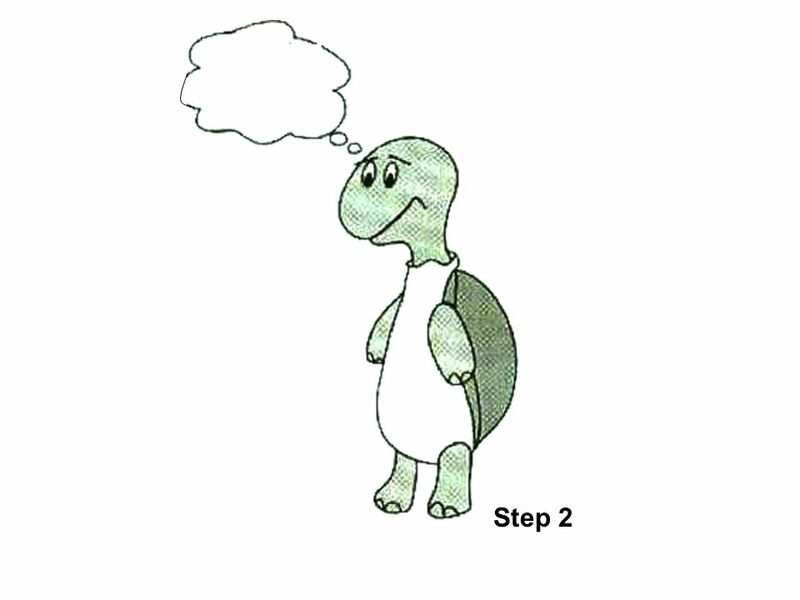 Model remaining calm Teach the child the steps of how to control feelings and calm down (“think like a turtle”) Step 1: Recognize your feeling(s) Step 2: Think “stop” Step 3: Tuck inside your “shell” and take deep breaths Step 4: Come out when calm and think of a “solution” Practice steps frequently (see cue cards on next 4 pages) Prepare for and help the child handle possible disappointment or change and “to think of a solution” (see list on last page) Recognize and comment when the child stays calm Involve families: teach the “Turtle Technique” Webster-Stratton, C. (1991). The teachers and children videotape series: Dina dinosaur school. Seattle, WA: The Incredible Years. 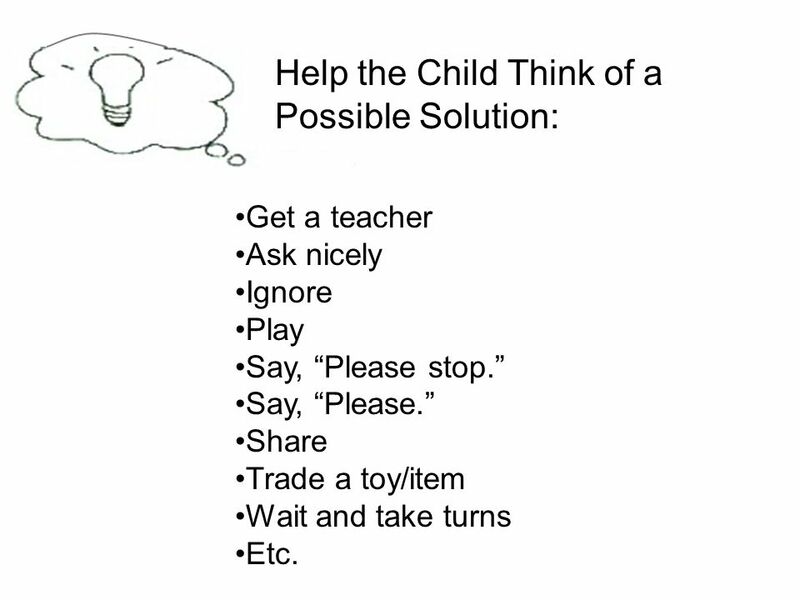 Get a teacher Ask nicely Ignore Play Say, “Please stop.” Say, “Please.” Share Trade a toy/item Wait and take turns Etc. 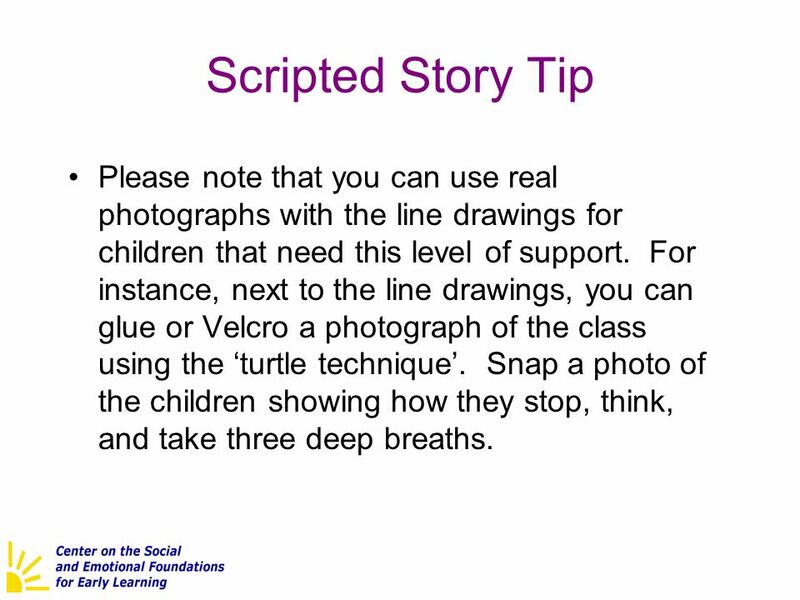 17 Scripted Story Tip Please note that you can use real photographs with the line drawings for children that need this level of support. 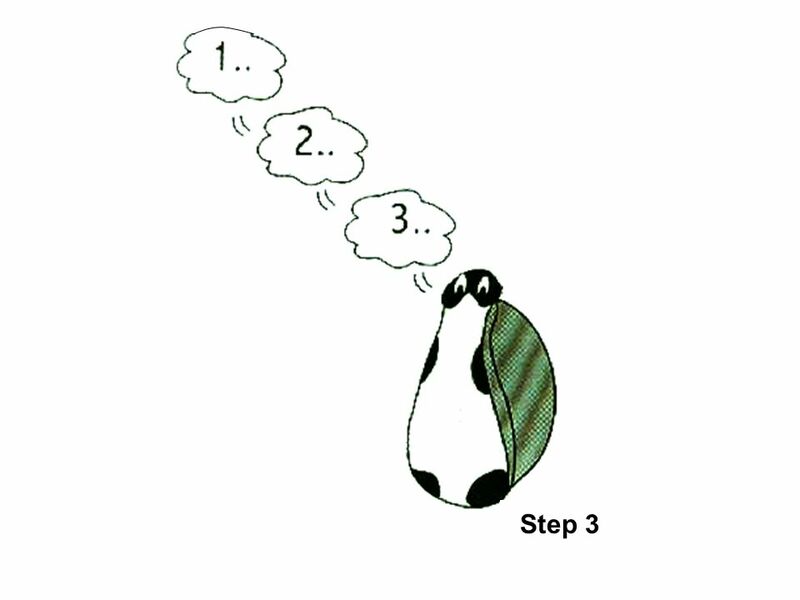 For instance, next to the line drawings, you can glue or Velcro a photograph of the class using the ‘turtle technique’. Snap a photo of the children showing how they stop, think, and take three deep breaths. 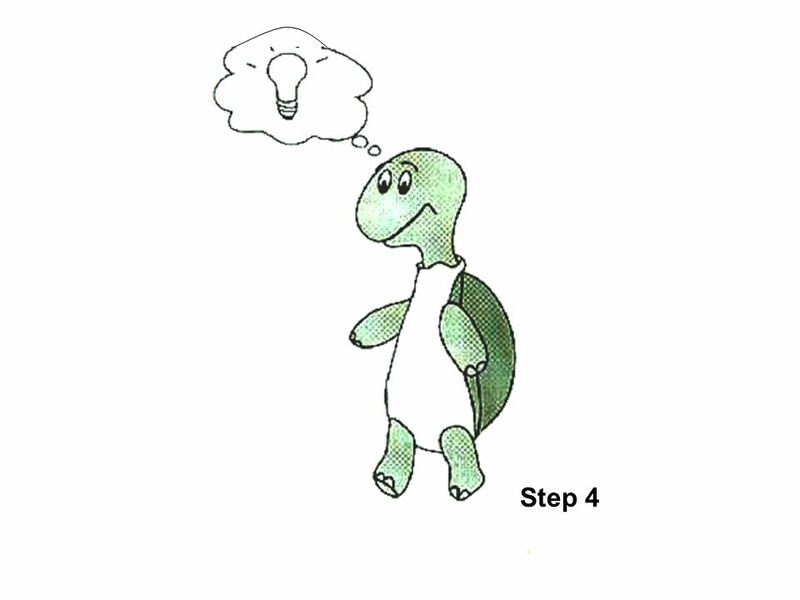 Download ppt "Tucker Turtle Takes Time to Tuck and Think"
Cue Cards Classroom directional cues can also be portable by placing visuals on a cue card ring Visual cue cards assist with teaching children what TO. 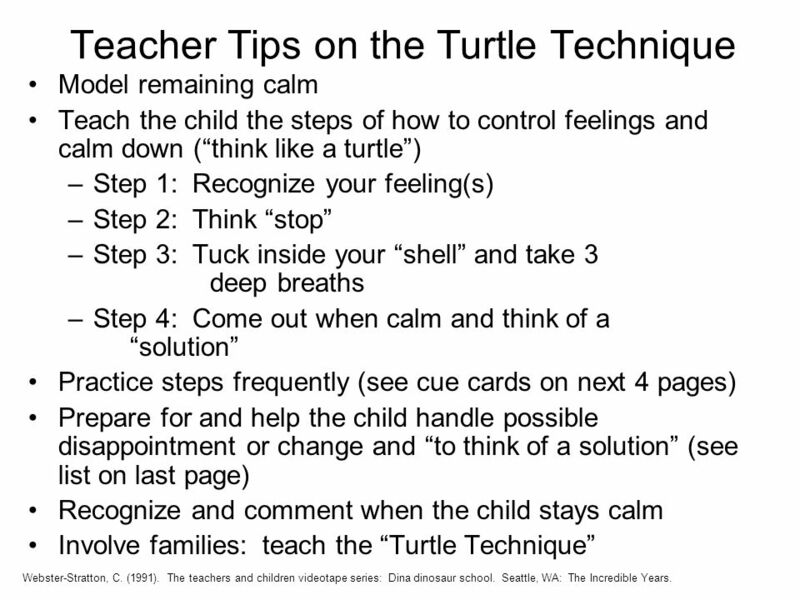 Turtle Technique The “Turtle Technique” is a technique for helping children with controlling anger (see next slide for steps to teach). This technique. Teacher Made Materials. Expectations Health and safety issues – Able to keep clean, durable, no small parts, etc. Connects to benchmark; connects to assessment/developmental. When Tucker Turtle Gets Too Excited, He Takes Time to Tuck and Think! Helping Children Cope: Strengthening Social Emotional Competence Lise Fox Technical Assistance Center on Social Emotional Intervention Florida Center for. By John Smith.  Art  Drawing  Computer/PS2 games  Spelling  History  First aid  Kind person  Sometimes happy. Potty Visual The “Potty Visual” is for use with children who are having difficulty with going potty independently. It is intended for use in the bathroom.